This recipe was prepared by Xylon Cassar, Senior Runner up from the Lamb Brand Kwalita' Malta Kids Competition 2016. 1. Sieve the plain flour in a large bowl, followed by the cocoa powder. 2. Add the oil and mix all together. 3. In a seperate bowl, place the egg, sugar, vanilla powder and lemonade and whisk all together. 4. Mix all the ingredients together in the large bowl until well combined. 5. In the meantime switch on the Cake Pop Machine. 6. Add 1 tablespoon of batter into each cake pop hole and bake for 5 minutes. 7. 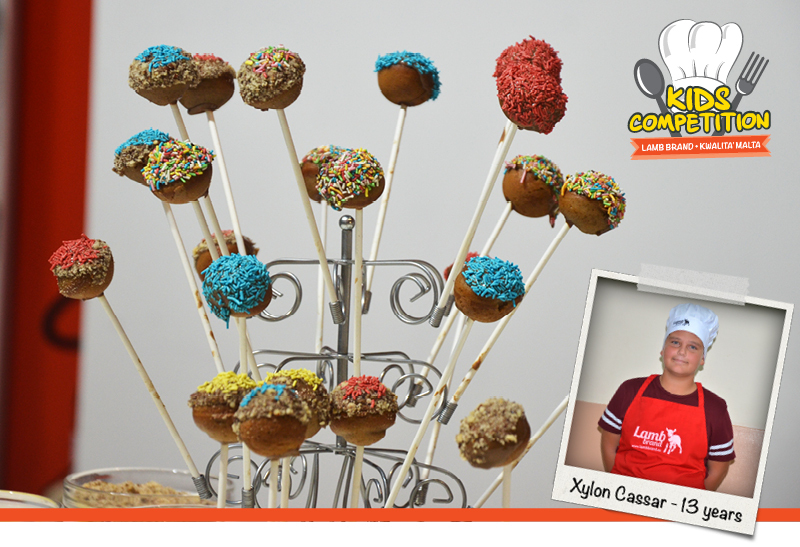 Place a stick in the ready made cake pops and pull them out and let them cool. 8. Melt the milk chocolate, glaze each cake top with chocolate and sprinkle some Rainbow Vermicelli.